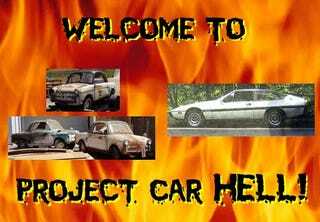 Project Car Hell: Lotus Eclat or 3 Bianchis? After a pair of close ones, we finally had a decisive victory in our last Choose Your Eternity poll, with the Taurus SHO using its Yamaha power to roar to victory over the SRT-Faux by a 70/30 margin. We're not surprised by that, but we don't have the foggiest idea who should be considered the favorite in today's matchup. Either choice would be serious fun with all the bugs worked out... but such big, crawly bugs! PCH, Front-Drive Detroit Muscle Edition: Turbo Neon or Taurus SHO? Today we're going old school with the source for a PCH ad; I dropped by Alameda's Lee Auto Supply (the last independent auto-parts store in the area and sponsors of the Park Street Car Show) and taped to the counter was this flyer for a '77 Lotus Eclat. The Eclat was essentially a fastback Elite, with all the pluses and minuses of the breed. You know it'll stick to the road... if it can reach the road, that is! This one is only $6500, and the seller claims it runs. Formerly owned by a "retired head mechanic for Lotus Racing," this car has upgraded cams, a Toyota transmission, and a Nardi steering wheel. The seller can't keep this fine machine, however, because "I have no garage, only a gravel-covered levee, which makes tinkering a challenge." Tinkering... is that what you call the kind of work that involves several hundred Lotus parts scattered all about the premises, with gobbets of raw knuckle-beef dangling from your hands and your wallet feeling distinctly light? Yes, that's what we call it, too! We love package deals, with the Instant Junkyard appeal and all that, and you'd certainly have to be thankful for some parts cars if you were to take on a Bianchi project. Our friend and microcar guru Jonee spotted this ad for three 1959 Bianchi minicars (go here if the ad disappears), and how could anyone resist these cars? Unfortunately, oxygen atoms were unable to resist getting together with the iron atoms in these cars' floorboards, and the seller speaks ominously of "other metal body work" as well. They've got 500cc air-cooled engines that haven't been started in years... but look at the bright side: when you get tired of replacing rusty sheet metal, you can rebuild three engines! And you don't have to worry that money spent on this project will be wasted, because last year one of these babies went for a stunning $39,599 at auction in Monterey. It's an investment!